St John's wort has traditionally been used to help with mild depression, anxiety and to lift mood generally. It is also used to help with pain and herbalists often recommend it for painful conditions such as sciatica and neuralgia. 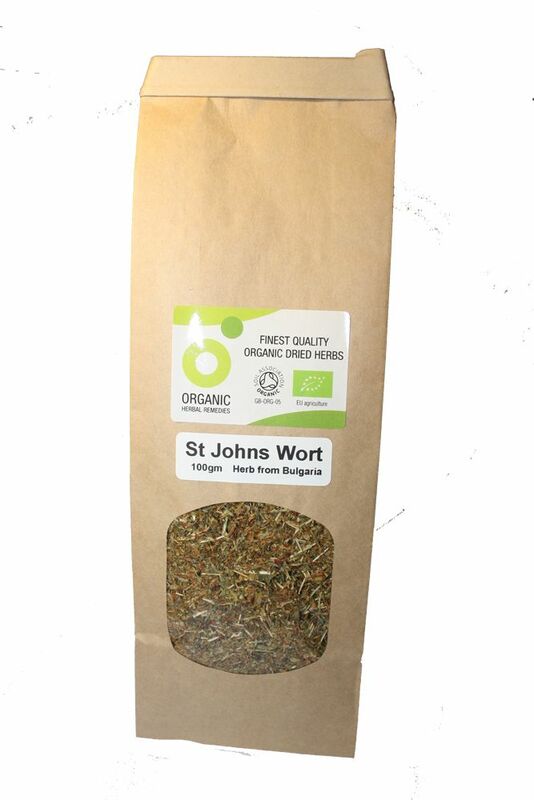 To make a St John's wort infusion or tea use one to two teaspoonfuls of dried herb to a cupful of water. Either make as a traditional tea or, to gain maximum strength, place the herb in a saucepan, pour on the water, cover with a lid and simmer gently for approximately ten minutes before straining. St John's wort is also infused with oils to make a pain relieving massage oil. For further information and recommended dosage please consult a qualified herbalist. We suggest no more than three or four cups of tea per day. See warnings below. Warning: The information on this page is not meant to replace the advice of your health professional. St John's wort is a powerful herb and should not be taken with other medications. Seek advice if breast feeding. Recommended to avoid excessive exposure to full sun or artificial sunlight UVA irradiation. Discontinue at least three days prior to general anaesthesia. Contraindicated with cyclosporin, digoxin, HIV nonnnucleoside reverse transcriptase inhibitors and other protease inhibitors, irinotecan and anticoagulant drugs. Caution is advised with photosensitising agents and selective serotonin reuptake inhibitors (SSRI) and other serotonergic agents, low-dose oral contraceptive pill, fexofenadine, midazolam, theophylline, simvastatin, and phenytoin.